So, you have chosen your wedding dress and the colour theme for the bridesmaids, cake and flowers. Well how about a colour theme for your venue, with LED lighting known as MOOD LIGHTING or VENUE PAINT to add to your special day. 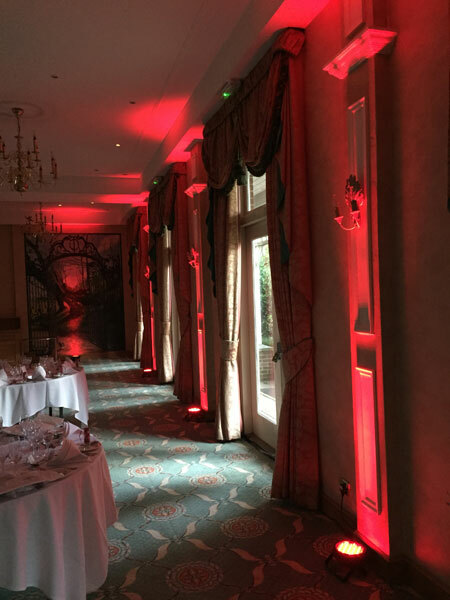 Mood Lighting can transform your venue into a colour of your choice. You can colour wash the walls to give the venue an ambience rather than just the plain white walls. Placing these lights can make the venue come alive and make it feel more comfortable and warm with the colours you choose to suit your theme. This will make your wedding day even more special. If you’d prefer, I can arrange a meeting at the venue of your choice so I can give you a demonstration of lighting up the walls. I can also discuss your disco entertainment whilst we are there. It is a standard procedure to meet all clients so I can gain an understanding of their needs and to give you a package which will be ideal for your wedding entertainment.